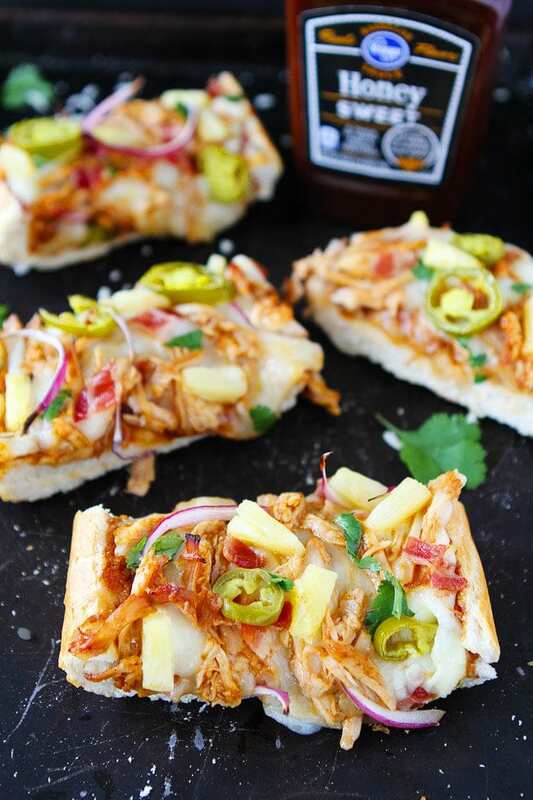 BBQ Chicken French Bread Pizza made with store-bought French bread and topped with BBQ sauce, chicken, bacon, mozzarella cheese, pineapple, jalapeño, and cilantro. This easy pizza is a favorite weeknight meal. 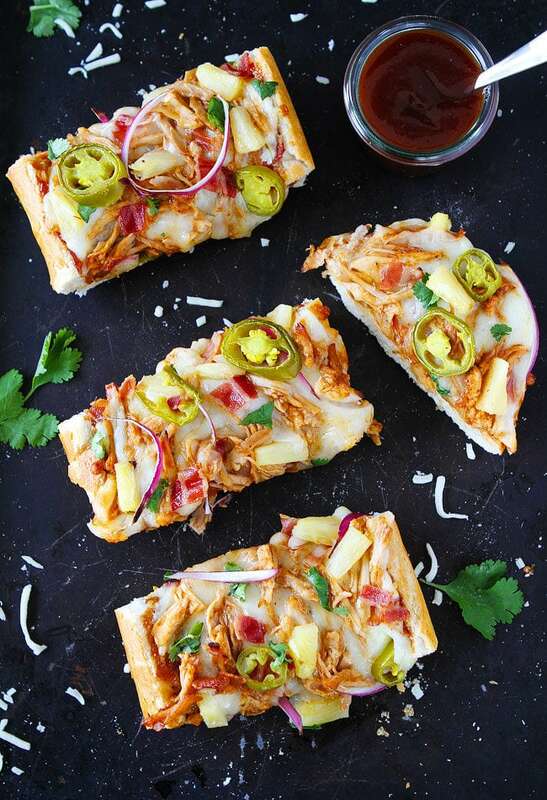 Father’s Day is right around the corner and this easy BBQ Chicken French Bread Pizza has Father’s Day written all over it. 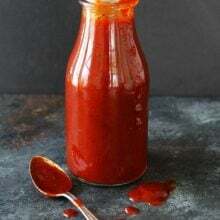 This is one of Josh’s favorite recipes and our boys love it too! When we have French bread pizza for dinner, there is no complaining, only eating. The boys don’t make a peep because they are too busy devouring their pizza. 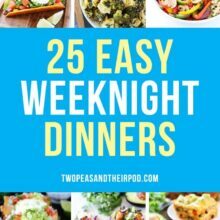 It is one of our their favorite weeknight dinners. Now, it’s time to tell you our little secrets for making this super easy pizza. First, we start with store bought French bread. 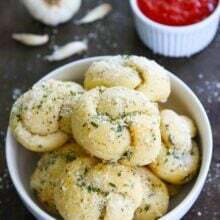 You don’t have to make homemade pizza dough, the bread is the crust! We buy our French bread at Smith’s, they bake fresh French bread every day and it makes the best pizza crust. 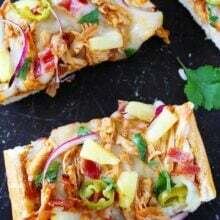 We also pick up a rotisserie chicken from Smith’s to make this pizza to keep the recipe super simple. We shred the rotisserie chicken and mix it with Kroger’s Honey Sweet BBQ Sauce. We buy shredded mozzarella cheese to save time in the kitchen. You can use pre-cooked bacon or you can cook the bacon in advance. Sometimes, Josh makes bacon for breakfast and saves a few slices for the pizza. If you aren’t a fan of spicy, you can leave the jalapeño slices off, but Josh uses tamed jalapeño slices so they aren’t that spicy, they just add great flavor! Bake the French bread pizza in the oven until the cheese is melted and the bread is slightly crispy around the edges. Top with a little fresh cilantro and cut into slices and EAT! 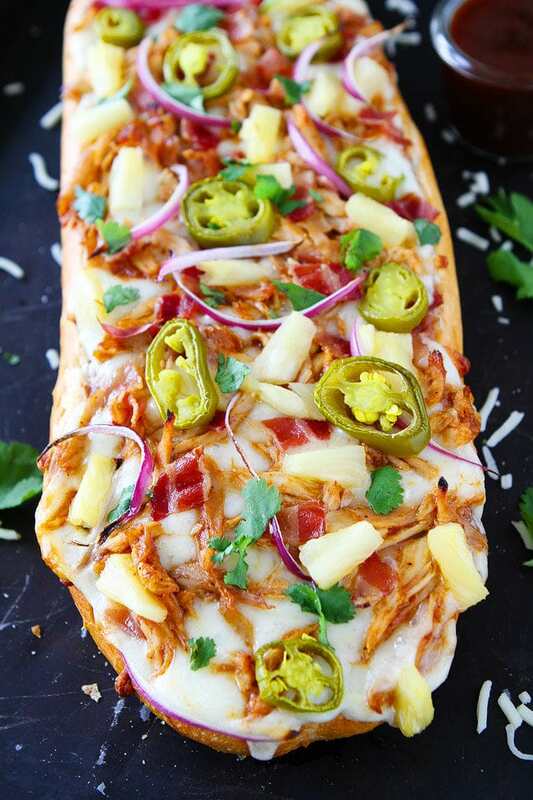 This easy BBQ Chicken French Bread Pizza is perfect for quick and easy weeknight meals, parties, game day, and Father’s Day. Enjoy! 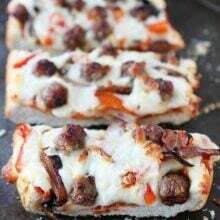 This easy French bread pizza is a great quick and easy weeknight meal. It is always a crowd pleaser! Slice French bread loaf in half lengthwise and place on a large baking sheet. In a medium bowl, combine the shredded chicken with 1/2 cup of the BBQ sauce. Stir until chicken is coated. Spread the remaining 1/2 cup of BBQ sauce evenly on the bread. 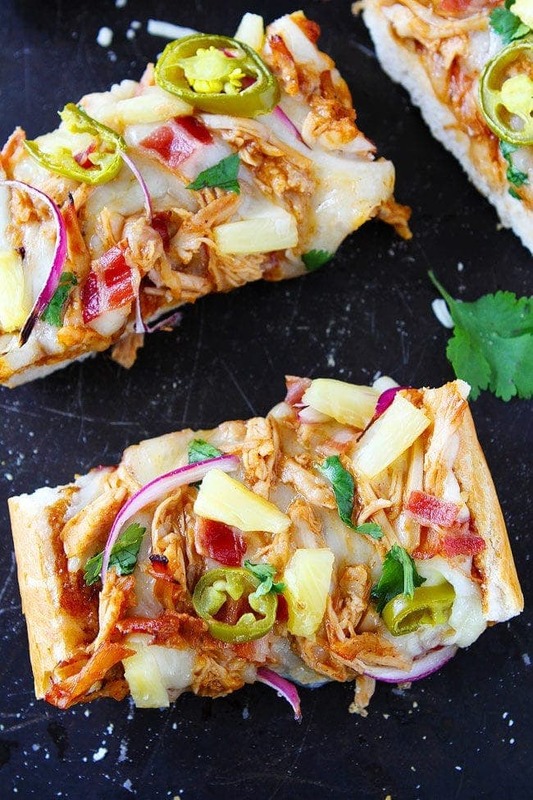 Top evenly with shredded cheese, chicken, bacon, pineapple, red onion, jalapeño slices, and chopped cilantro. Place the French bread pizza in the oven and bake for 15 minutes or until the cheese is melted and the bread is crisp around the edges. Remove from the oven and cut the pizza into pieces. Serve immediately. This post is in partnership with Kroger, but our opinions are our own. Thank you for supporting the brands that continue to make Two Peas and Their Pod possible. These look amazingly delicious! I must try them for dinner next week! Wow — looks so delicious!!! I love BBQ chicken on pizza! I just know that those jalapeño peppers are going to provide a special kick. Nice one! BBQ sauce on pizza is always a good idea. So much yumminess going on here, and I love how easy this is! Thanks for the inspiration! love jalapenos and spice in food in general, also good thought about using fresh french bread as crust, also like all of these flavors in a pizza, nice change at least for me, thank you for this!